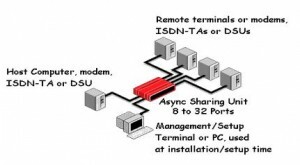 The DCB Async Sharing Unit (ASU) shares a single port with 4, 8, 16, 24 or 32 others. Data received on the shared common port is broadcast to all the other ports. The ASU makes it easy to share async polling networks. The ASU can be used with terminal devices, multipoint modems, point-to-point modems, DSUs, over ISDN, or over frame relay. The ASU is the ideal product for this requirement. It supports async port speeds up to 38.4 kbps. One method of selecting ports is using terminal device RTS/CTS RS-232 control leads. The ASU constantly scans all ports for Request to Send (RTS). When a terminal device asserts RTS, the RTS signal is passed from that port to the common shared port. On the common shared port, the RTS lead is passed out to the modem. The common shared port Clear to Send (CTS) response is passed back to the terminal that asserted RTS. The connected device will send data upon receiving CTS. After the terminal device completes its transmission and lowers RTS, the scanning resumes. In the RTS/CTS control mode, data from a port is discarded if RTS is not asserted. The anti-streaming timer option for the ASU blocks transmission from a port if that port holds RTS on for more than 8 seconds. This is useful in systems that experience “hung” ports due to terminal device RTS or modem DCD staying on in error. Turning RTS off and back on or a reset of the ASU will reset the anti-streaming timer. The combiner mode of the ASU is perfect for polled systems that do not have RTS/CTS control. For example, many RTUs used in SCADA and other control system environments are implemented with just three RS232 leads, transmit data, receive data and signal ground. The ASU may be used at the host end of a system, where the multiple ports are connected to line drivers, modems, DSUs, etc, and where the Carrier Detect (DCD) signal is constantly on, rather than switched. In these applications, the ASU combiner mode takes all data from the ports and passes that data to the network composite without RTS/CTS control. RTS is ignored in the combiner mode. The ASU can be used at the remote locations where the common shared port connects to a modem, ISDN TA or DSU. The ASU can also be used at the host end of a network to share one host port with many modems, ISDN TAs or DSUs. The MSU-6 is a port sharing device ( MSU ) designed for sharing one RS232 link with multiple DTE devices. The composite or DCE port of the MSU is typically accessed by RTS control. The MSU-6 can be modified to logically “OR” the 6 ports to the composite. The devices can be synchronous or asynchronous. The interface is RS232, up to 256 Kbps. All data from the composite, or common channel, is broadcast to all 6 ports. Data from the ports to the composite is sent only from the port that has asserted RTS and has received CTS back from the composite port. Ports are scanned at a sub-millisecond scan rate.